One of the most crucial parts of being a homeowner is having the skills to properly maintain your property. By keeping your property well maintained, you can avoid pricey repairs and severe damage from occurring. If you can maintain your home and provide preventive care, you can prolong your property’s life and save yourself a significant amount of money in repairs. At least twice a year you need to do a full inspection of your home to ensure that there are no problems that need fixing. Each time you perform a home maintenance check, make sure to check your windows and doors. Check to make sure that doors and windows are sealed properly and aren’t letting any heat escape. Leaking doors and windows can cost you a lot of money in energy bills and need to be repaired. It is also important to check that your windows and doors close properly. If you notice that your doors or windows no longer close or latch properly, this could be for two reasons. One, the door or window has swollen due to rain or two, that your property’s foundation may have shifted. If you are concerned about foundation problems, it is best to get this checked, as the longer you leave it, the worse it will get. And the worse it gets, the more it will cost to fix. The foundation repair cost will be much lower if the problem is fixable, if a new foundation is needed it can be very expensive. 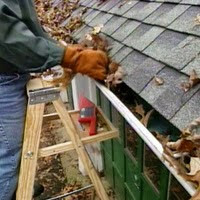 One of the most important home maintenance tasks, you must do is clear out your gutters and downspouts. If you leave these to fill up with debris, like fallen leaves and twigs, they will be unable to direct water away from your house. If the water is not drained away from your property, it can collect in the roofs eaves and around the foundations, causing leaks. Another important part of maintaining your property comes from regularly checking the roof. Check the roof for loose or damaged tiles, this is especially important during the winter months. The sooner you spot the damage, the cheaper it will be to repair. That is why it is important that you keep on top of your roof maintenance and check your roof for signs of problems every few months. As well as keeping an eye on property maintenance, it is also crucial that you properly maintain your garden. Each time your do a home maintenance check it is a good idea to check the condition of your decking. You should check to see whether it is in good condition and whether it needs another topcoat. You should also check your patio and pathway for any cracks. If you notice any problems, it is a good idea to deal with them and get them fixed as soon as possible. By taking care of your property and properly maintaining it, you can reduce the risk of expensive problems from occurring. Hate Your Kitchen? Check Out These Awesome Tips To Help Transform It!